Many dog owners wonder about the food they feed their canine companion and whether or not it has all the nutrients that he needs. Often the question is one: whether or not to give it some type of supplement or vitamin. Why are Supplements And Multivitamins Important? There are several reasons why supplements and multivitamins are important, not the least of which is the quality of the food you are feeding. There are supplements and vitamins available for all of these and more. The question is which supplements and vitamins are the best? We could look at each of these categories separately and all the products in that group. Instead, we are going to look at the best supplements and multivitamins no matter what they are for and look at the pros and cons of those products. 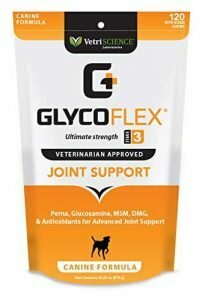 Glucosamine– this is a supplement for a dog who has joint pain and/or arthritis. Because of the activity level of most dogs in running, jumping and playing, dog’s cartilaginous joints can be worn away. This happens most commonly in the hips, knees, lower back, elbows or wrists. Here are some of the best of these products. Extend is one of the best Glucosamine supplements on the market today. Over time it will repair cartilage and joints and restore flexibility in the joints. 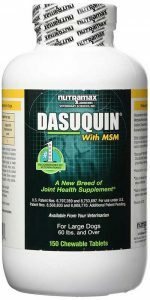 The formulation provides better connective tissue functioning, better hydration and better health for the joints. Most dogs show improvement within two to three weeks. Easy to mix with any type of dog food. 100% natural and safe. Veterinarian recommended. Some dogs don’t like the flavor. Some dogs did not show the improvement that the majority of dogs did. This supplement is chewable and contains only natural ingredients including things like soybean and avocado to strengthen bones, green tea in addition to glucosamine, chondroitin and MSM. This supplement is particularly geared to larger dogs over 60 pounds (27 kg). Does not need a prescription. Many saw results in 5 to 7 days. More than ten years of research went into the formulation. The most complete joint relief formulation on the market. 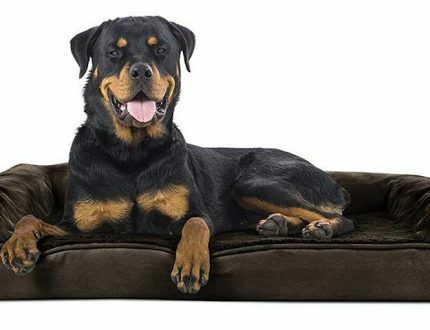 Only for dogs over 60 pounds (27 kg). Some owners felt the product did not work as well as it had in the past. This product has an unusual formulation compared with the others we have discussed. 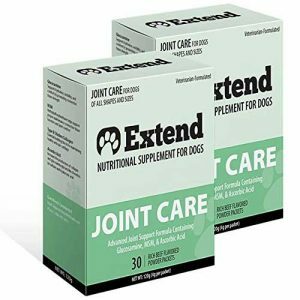 For active or working dogs and for older dogs this is one of the best supplements, made with Perna canaliculus – a New Zealand green-lipped mussel – is the building block for well-developed and strong cartilage. A unique and highly effective formulation designed for active, working or older dogs. Contains Perna Mussel. Natural chicken flavor that dogs find appealing. This is for ordinary joint issues not for serious cases. 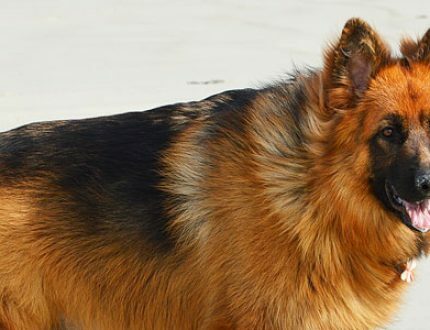 Dog supplement for skin and coat can provide a variety of functions. The best of this group are those that treat a variety of disfunctions with one formulation. These issues are often allergy related but not always. Food intolerance or flea dermatitis are often the causes but no matter the cause all have inflammation, itching and sometimes pain. Fish Oils – there is research evidence that Omega fatty acids are very effective in dealing with skin, coat and immune system issues. DLPA (di-phenylalanine) reduces inflammation especially in the back. Vitamin E and C for antioxidant functions. 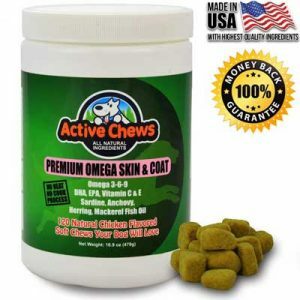 This product is made with Wild Alaskan Salmon Oil and vitamins, fiber and antioxidants in a chewable treat that dogs enjoy. 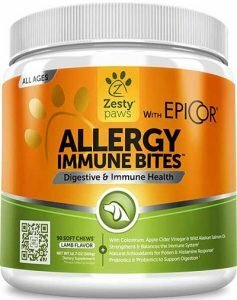 It also contains immune systems boosters and helps to deal with allergies that your dog might have to food or environmental agents. Contains EpiCor – an ingredient that has undergone extensive studies that shows its award winning support for the immune system. It contains nutrients, vitamins, metabolites and polyphenols. Most dogs really like the taste. Within 3 weeks your dog’s coat will be allergy free, softer and thicker than before. You have to be patient. Doesn’t work immediately for all dogs. Could take 3-5 weeks. It’s very good supplement for shedding. This product does a very good job on itching and shedding skin issues. It contains only natural ingredients like yellow dock root, MSM, omega fatty acids and quercetin. It is made in the United States. Product was formulated by a veterinarian. Contains essential fatty acids such as Omega 3 and Omega 6. Good for hydration of the skin and a soft healthy, silky coat. The yellow Dock Root is a herb with many antioxidants for the coat and skin. MSM helps to keep the histamine levels normal for dogs with allergies. It is approved by the National Animal Supplement Council. It doesn’t work for every dog. Does not have a 30 day guarantee. 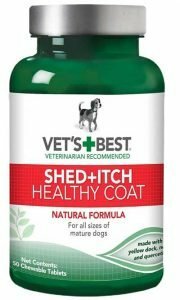 This fish oil product is excellent for a dog’s health including a shiny coat. It contains a fish oil tablet with Omega 3,6,9 fatty acids. Also you can get a bottle with 60 free tablets. Made in the US at a certified organic facility. Treats skin, coat, and prevents or heals hot spots and protects immune system, heart and joints as well. Reduces inflammation, pain and discomfort while increasing mobility. No ingredients that are not safe for your dog. Even though the bottle contains 120 pills you give 3 in each serving and they don’t last as long as you expect them to. Some dogs don’t like the taste and won’t eat them. This product is good for a healthy dog heart, brain and skin. This is a combination of fish oils including salmon. All US ingredients and made in USA. Contains Omega 6,9 and 3 with a natural flavor of chicken, Vitamin E, Vitamin C, Vitamin H.
Produced at an FDA approved facility. Inspected annually by APHIS. Money Back 100% guaranteed. Certified by an independent lab. No adverse side effects for most dogs. Contains sardines, herring, anchovies and mackerel. Developed in a no heat no cook process. Some dogs don’t like the taste. Did not help the dry skin for some dogs. As your dog ages it might develop cataracts or if it is diabetic, could develop other types of eye issues. There are several preventive or maintenance supplements for dog eyes. The supplements we talk about here can solve eye issues your dog may have now. It is preventative for any possible vision problems. This product has dedicated nutrients for the health of a dog’s eyes. It has 12 antioxidants that support the dog’s eyes on a cellular level. Antioxidants in this supplement protect your dog from oxidative deterioration. Scientific formula specifically designed for the protection and nutrition of the eye structure. Contains Lutein for retinal and lens issues in dogs. Contains only the best ingredients including pharmaceutical grade omega 3 and grapeseed extract. Brand that you can trust. Ocu-GLO is the world wide leader in scientific research for quality products. 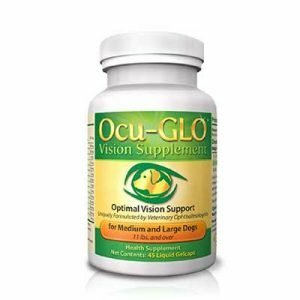 Ocu-GLO was developed by veterinarians, scientists, ophthalmologists and pharmacists. All of which are veterinary board certified. Members of the National Animal Supplement Council. (NASC). Contains 12 antioxidants for the eyes, pharmaceutical grade Vitamin C, B and E; zinc, lycopene and coenzyme Q10. Your dog needs no other vitamins. The capsules were too large for hiding in food and some dogs won’t take them. If the capsules sit around, they leak a red vitamin fluid. Some dogs do not like the taste and will not eat them. These supplements are some of the best on the market for their particular functions. 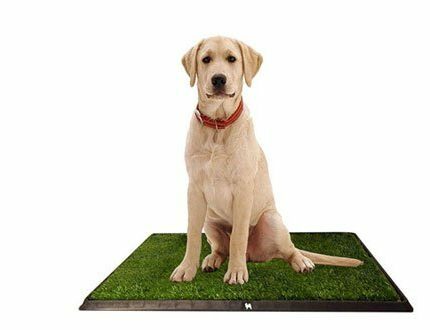 All of them seems to have the situation occurring with some dogs who do not tolerate the supplement or vitamin well at all. However, this is only a small portion of all dogs. For most dogs these supplements are very effective. The best of the best are the supplements and vitamins that have scientific research behind them or a brand name that you know you can trust because of the research and quality care that go into their products. Choose products made in the United States with ingredients from the United States whenever is possible. Again, it is better if the product, its ingredients or even the facility where it is made can be certified and inspected. So, if you want optimal health for your dog, check out the supplements and vitamins that are preventative or preemptive. If your dog already has a condition discussed here, then find the right supplement or vitamin for it. Just check the reputation of the manufacturer, the quality of the ingredients, the quality of the finished product, and possible side effects. With all the supplements and vitamins on the market, you can surely find what will be the best for your dog. 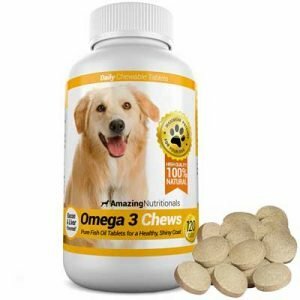 I’m giving my dog these Amazing Nutritionals Omega-3 Fish Oil supplements and he loves the taste of it, its like a treat for him and coat started to shine after giving him these vitamins for 3 months straight.